I have been around the great game almost all of my life and worked on the broadcast television side of it for a quarter of a century. I was well aware of the important role the thousands of men and women, who graciously and gleefully give up their time, play in the success of an event. Our ESPN and Golf Channel production teams were constantly grateful for their service. I know how hard they work, I realize how much they do. I made it a point, every day before a broadcast, to thank they assembled group. I meant it because we couldn’t. I walked back to the TV truck knowing my co-producer Karel Schilksbier would get them prepared for the telecast. I counted on him to do just that. I counted on them and so did the tournament. Now I was about to be one of the ones being counted on. I signed up, paid the fare, and received two logoed golf shirts, a light rain jacket, a ball cap and a reusable water bottle in the mail. There was one “all volunteers meeting” held weeks before the championship. It was a chance for the USGA to go through the basic ground rules of what was to be expected of us during the week. It was also a chance for the volunteers in each area to meet their volunteer chairman. I had signed up for and received the assignment to be what’s called a “walking scorer”. If you’ve been to a golf tournament you’ve seen that person walking purposefully up the fairway, clipboard in hand, behind the players. He or she is almost always accompanied by another volunteer holding a standard with the name and score of each player in the grouping or pairing. They work as a team; the numbers on the walking scorer’s score sheet should match the red or green digits on the standard. That way everyone in the gallery knows how each player in that particular group stands in relation to par. The man who would be in charge of all the walking scorers for the week was a friendly, outgoing, clearly knowledgeable, guy named Mike Walsh. He was a walking scorer veteran having volunteered at many major events including the U.S. Open (he walked, on Sunday, with eventual champion Dustin Johnson’s pairing in 2016 and was with the last group during the historic Olympics golf competition). I hung back and watched and listened as several of my contemporaries said hello and recited their own resumes to Mike. “I’ve scored dozens of PGA events,” said one. “This isn’t my first rodeo,” bragged another. “I’m usually with one of the last couple groups,” said a third expectantly. He nodded, smiled and offered no promises. Then it was my turn. “Hi Mike, I’m Keith Hirshland,” I said extending my hand. “I’ve never done this before so put me with whichever group you want. I’m just here to help.” He smiled and shook my hand. “I appreciate that,” he said, “but you’re not getting off that easily. 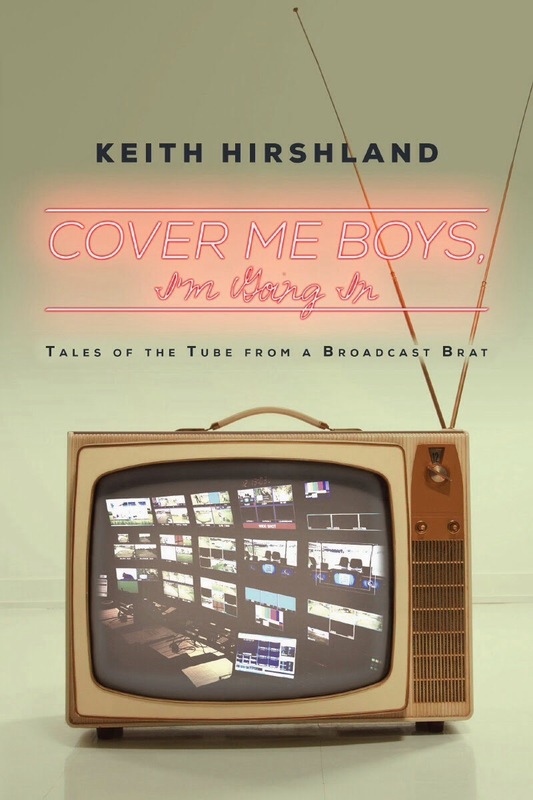 I read your book.” He was speaking of Cover Me Boys, I’m Going In (Tales of the Tube from a Broadcast Brat) my 2013 memoir in which I tell stories of my time producing live golf events for both ESPN and The Golf Channel. As I said I was the guy, in the truck, occasionally yelling at the guy, out on the golf course, that I was about to become for the U.S. Women’s Open. “I mean it,” I reiterated, “I have absolutely no expectations, and you shouldn’t either.” He laughed at that. As the days until the event got closer I received an email from Mike telling me that I was expected for a mandatory meeting on Tuesday of championship week to familiarize myself with the computer system. There was also a list of times to report for Wednesday’s practice round as well as the championship itself. I would be working the afternoon shift on Wednesday, Thursday and Saturday. I had morning times on Friday and Sunday. Wednesday afternoon I had the pleasure of practicing with the scoring system inputting strokes and scores for the defending United States Women’s Open Champion, Brittany Lang, Ryann O’Toole and amateur Virginia Elena Carter. It went off without a hitch. It was also Wednesday. There was no pressure and absolutely nobody was affected if I made a mistake. Still I must admit I was a little nervous. I knew the next day my counting started counting. Because I was working Thursday afternoon there was a chance that I would be with a grouping that was also accompanied by a FOX Sports camera crew (probably someone with whom I had worked during my time at ESPN and Golf Channel). I could have been with Cristie Kerr or Michelle Wie or Seo Yeon Ryu. They all were going to tee off around the time I was scheduled to assist. I arrived for my shift on Thursday and headed for the volunteer tent, the place where we all would hang out waiting for our name to be called so we could grab our equipment, meet the standard-bearer, and head out to the first or tenth tee. When I arrived Mike was surrounded by folks checking in, chatting, or hoping to convince him they belonged with a “better” grouping. I’d say Mike’s job is like the expression “herding cats” but with less cuddly creatures. I waited my turn, said hello, and then parked my tush on a plastic chair and waited. It turned out the group for me was Mo Martin, Carlotta Ciganda and Jin Young Ko; 1:36 PM off the first tee. I gathered up my gear (hand-held sized computer attached to a clipboard with a score sheet to pencil in what is called a “shot trail” for each player on every hole, a couple of small pencils, and a radio to communicate with “scoring central”). There was also a plastic bag attached to the back of the clipboard to protect my equipment, and pieces of paper, from inclement weather. Did I mention it was supposed to rain that afternoon? It was. I walked the handful of steps to meet the person who would walk with me, the one carrying the standard that would bear the score, in relation to par, of the three professionals. Her name was Chie, she might have been 12, and she didn’t play golf. She was there because her friend asked her to volunteer so she did. Chie said she was a little nervous and I told her not to worry, I’d take care of her and off we went to the first tee. Once there we met the three players and their caddies (Ciganda’s was a veteran named Terry McNamara who, for years, worked with/for the great Annika Sorenstam). I told the computer , and thus central scoring, that I was “in position” and entered the required “player clothing” (hat color, shirt color, pants color) into the machine so the volunteers operating laser devices on the course could more easily identify which player was hitting. Each player was announced on the tee, struck their first shots of the 2017 championship and then, as a group, headed down the fairway. Chie and I were right behind them. I asked Chie if she liked math and she said she did. “Got it,” she said. And she did. Out of our group Jin Young Ko kept me and Chie the busiest over the first 9 holes. She made four birdies, two bogies and three pars and turned at minus 2. The Spaniard, Carlotta Ciganda, was also 2 under but with seven pars and two birdies. Mo Martin was minus 1. Martin and Ciganda started the second nine holes with pars but Ko made a 6 so Chie went back to work. The skies had been threatening and as the players approached the 11th tee word came over my scoring radio that play was about to be suspended. Before Mo Martin teed off 11 (she had the honor) officials blew the air horn stopping the championship in its tracks. The players headed for the clubhouse while Chie and I went back to the volunteer tent. After a couple of hours of a rain delay we were set to go back out for the resumption of play. I reunited with Chie who had a slightly worried look on her face. “You ready?” I asked. She nodded, then she spoke. “Can you stay that long or do you have to go?” I asked. She didn’t answer. “It’s okay if you have to go, nobody will get upset,” I assured her. “I think I have to go,” she answered. “No problem,” I said and I told her she did a great job. Chie said “thanks” and walked out the door. I did too and headed for the eleventh tee. It was still raining but the dangerous conditions had passed. My clipboard was sheathed in its plastic bag so it stayed dry. I didn’t. I ducked inside the scaffolding that supported the camera at the tenth green and waited for the players to reemerge. Eventually they did, the officials hit two blasts on the air horn, and off we went again; sans Chie. Rain came and went for several holes but stopped for good as the group played the 15th hole. Ciganda had birdied 11 and 13 to get to minus 4 (best round of the afternoon wave) while Ko had backed up her double bogey at 10 with bogeys at 11 and 12 to fall to plus 2 for the day and Martin birdied the par 3 14th to get it back to even par. But those scores were our little secret because there was no standard-bearer with our group. The clouds tried to break up and there were patches of blue which helped illuminate a setting sun. The last four holes (two par 5’s, a par 3 and a par 4) would take a little more than an hour to play so we were racing the setting sun. As we walked up the hill to the 17th green I was side by side with Terry McNamara. “Is your name Terry?” I asked, “did you use to work with Annika?” I added. “It is and I did,” he answered looking at me. “You too,” I replied and peeled off. On the green Mo Martin’s caddie asked a USGA official if suspension of play for the day due to darkness was imminent. He assured him it was not so under ever darkening skies the group putted out there and walked to the tee at the final hole. Ciganda (still -4 for the day) had the honor and she teed off. Right down the middle ( or so we thought because it was difficult to see) and then they blew the horn for, stopping play for the second time that day. Because this suspension was for “non dangerous conditions” and since Ciganda had already hit her tee shot, the group had the option to continue playing and they did. All three hit seconds into the fairway at the par 5 18th and we walked toward the green. As Carlotta and Terry surveyed the situation she decided it was too dark to see the flag and announced her intention to stop for the day. Martin and Ko, as was their option decided to keep going so both hit thirds. Ciganda marked her ball in the fairway, thanked her fellow competitors and walked toward the clubhouse. Up at the green both Ko and Martin agreed it was now too dark to finish so they marked their golf balls and that was it. What it meant was we would all be back Friday morning (me at 6 AM, them at 6:45) to hit somewhere between 3 and 7 shots to complete round one. It was past 8:30 PM. I got up at 4:30, showered, put on my volunteer uniform and drove to Starbucks where I waited for them to open at 5:30. Got a latte and headed for the volunteer parking lot to catch a bus back to Trump National Bedminster. After checking in I went to the 18th green and watched Carlotta, Mo and Jin finish round one on day two. As it turned out Ciganda may have been better off finishing the night before because she took three shots to end her round with a bogey and a 3 under 69 (5 off of Shenshen Feng’s lead). Martin and Ko both made pars and we all went inside to get ready for round two. I was assigned a new grouping (Karine Icher, Hanuel Kim and Ai Suzuki) and a different standard-bearer ( a delightful young lady named Emily who plays golf on her PGA Junior League team) but we started on the first tee again, so off we trudged. We got there a little early and watched 7-time major champion, Hall of Fame member and pal, Karrie Webb tee off in the group in front of ours. The Webb/Annika Sorenstam rivalry of the late 1990’s, early 2000’s was one of professional golf’s great match ups and thanks to my spot in the Golf Channel production trucks I had a front row seat for all of it. Several minutes later Icher, Kim and Suzuki arrived. As I was inputting clothing colors into my device I heard Karine ask if, because of the wet conditions, they were playing the second round using “preferred lies”. That means “lift, clean and place” to you and me and while other governing bodies running different championships have employed this practice; the United States Golf Association never has and never will play any of its championships that way. A simple shake of the head from the official started was the only answer Icher got. I knew then and there that this was most likely going to be a long morning. It was. None of the three broke par (Suzuki shot 76, Icher 77, and Kim 78) and all of them missed the halfway cut. I turned in my sheet, gave back the equipment and said goodbye to Emily and headed home. Thankfully I was comfortably on my couch, petting my dog, when the President of the United States showed up at the golf course later that day. The schedule originally had me coming in late on Saturday, not last pairing late but close, and I had apparently done a good enough job that it didn’t change. When I arrived I again greeted Mike who admitted that while he enjoyed supervising the lot of us he would have much preferred being out among us scoring himself. I didn’t offer to switch places. He gave me my assignment which meant I would be scoring and walking with the third to the last pairing which included my old friends Carlotta Ciganda and her caddie, Terry McNamara. Carlotta would be paired with a South Korean golfer named Seon Woo Bae. This time my standard-bearer was a freshman to be at Iona named Carl who, he said, played golf on his high school team and had teed it up at Trump Bedminster with a friend on several occasions. Carl knew what he was doing. As we waited for the players to arrive Carl asked if I “knew” the players with whom we’d be all afternoon. I said I had scored for Ciganda’s group on Thursday. “Annika who?” asked Carl. Kids these days I thought. As the players arrived to the tee Carlotta smiled and said it was nice to see me again. Ms. Bae smiled, shook my hand and bowed. “I hope you bring us luck today, Keith.” It was McNamara. “We didn’t play as well without you yesterday.” They had shot 1 under par on Friday and sat 4 shots back of second round leader Shenshen Feng. It looked like I might when Ciganda hit Driver, 3 wood just short of the par 5 first green but then she three-putted for par. Five more pars followed. She was stuck in neutral. Luckily so were the leaders so Carlotta hadn’t lost any ground until the par 3 7th where a pulled tee shot missed the green left and she failed to get up and down. For the first time that day Carl had to change Ciganda’s score. Bae, on the other hand, stumbled out of the gate and made three bogeys in her first six holes. Ciganda rolled in a long birdie putt on the 9th and she headed to the second nine at even par for the day and 4 under for the championship. Momentum seemed to be a difficult thing to find all week at Trump Bedminster and Ciganda followed her birdie at nine with four consecutive pars. The par 3 14th was a 196 yard, par 3 on Saturday; Bae who had bogeyed 11 but birdied 12 had the honor and hit a fairway wood onto the green. Ciganda chose 5 iron and miss hit it slightly. It carried the hazard in front of the green but not by much so she pitched out of the gnarly rough then missed the putt for par. A bounce back birdie at the next hole got her back to even and -4 and I thought one more birdie coming in will put her in great shape; two would be even better. She and Terry were probably thinking the same thing but she missed makeable putts on 16 and 17 then a pulled wedge for her third at the 18th led to a finishing par. Two bogeys, two birdies, 72. I hadn’t necessarily brought her luck but I certainly wasn’t a “black cat” either. Bae, on the other hand finished with back-to-back birdies and shot 74. Both would tee it up Sunday with an outside chance to win the championship, Carlotta’s better than Seon Woo. Off the back of the green both players and their caddies thanked Carl and me. Bae handed us signed golf balls (the fourth I had received that week) and I told it was a pleasure to have scored for them and I hoped they both played well on Sunday. Then I did what I had done for the previous three days; I handed the score sheets to a USGA official and returned the gear to the volunteer tent. I was scheduled to be “morning relief” on Sunday but couldn’t imagine anybody NOT showing up, and I was right. I did my duty and hung out just in case I was needed but it was apparent early on that my volunteer experience was at an end. I had a blast. The players were great, the experience was everything hoped it would be and the event was amazing. Special thanks to Mike Walsh, Ross Galenault and all the volunteers who made the 72nd United States Women’s Open such a special championship. I also want to thank Mo Martin, Seon Woo Bae, Jin Young Ko and my new favorite player, Carlotta Ciganda. If a USGA Championship or any professional event comes your way and you have the time, I highly encourage you to volunteer. You won’t regret it.